Over the last 117 weeks (2 and 1/4 years), the biology of every weaver species (family Ploceidae) was covered. The sequence was random, although first one species from each genus was chosen, and usually better known species were covered sooner. Type specimens - where housed, if known. As usual, the news item will be well illustrated, usually including the first published illustration of the species. The sequence of species will be chronological, ie in the sequence that the weaver species were originally described. Linnaeus described 5 weavers in his monumental work on describing animal species in Systema Naturae, ed. 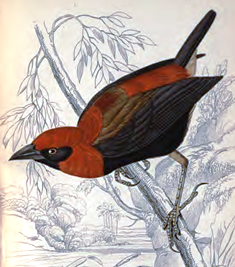 10 in 1758, and the first of the 5 weaver species listed is the Black-winged Bishop. Enjoy the series!